Jonathan Zilberg PhD attended me on the book Myth and Magic, The Art of the Shona of Zimbabwe, written by Joy Kuhn and published in 1978. 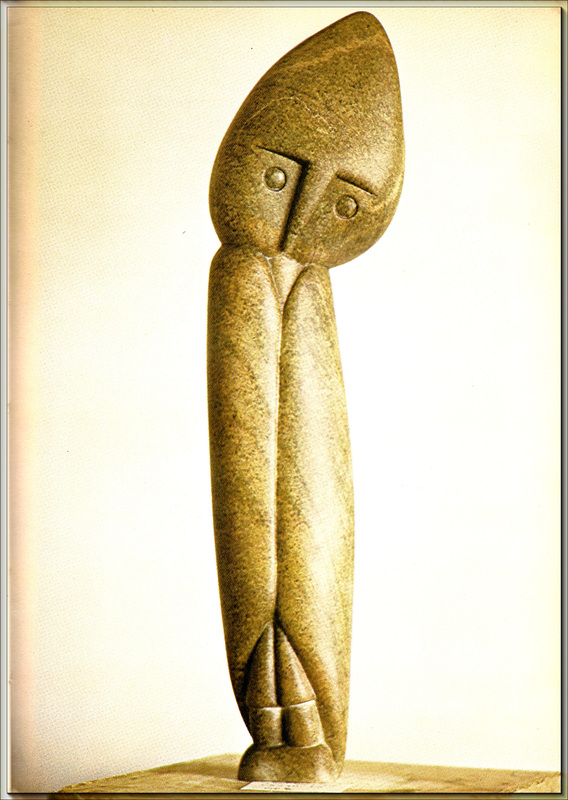 It is one of the first publications of books about the Zimbabwean Stone Sculpture, starting in the 60s and 70s [Note 1]. I searched on the Internet for this book and I found a used copy of this book for an acceptable price (Fig 1), from someone in Scotland. When I received it, I discovered that it looks and smells like an old book. Despite this I am very delighted with the book. Joy Kuhn is not a professional art scientist, but she has had spent a substantial part of her life in Central and South Africa. The book contains a lot of photos of sculptors in the late 60s and early 70s. Unfortunately, in the book, she mentioned the names of the sculptors in the manner they were used at that time, i.e. only by first name. In the case of ‘Henry’ it is not a problem. She meant the late Henry Munyaradzi. But the reference of the artist’s name ‘Ndale’ arises some questions. 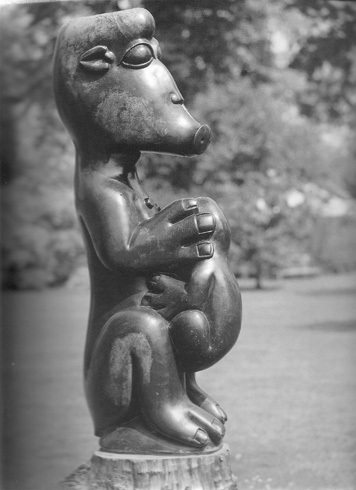 By looking it up in the lexicon Sculptors from Zimbabwe by Ben Joosten (2001) I found out that the sculpture belongs to the late Ndale Wile, a Malawian, who sculpted at the Tengenenge Sculptor Community. Likewise, the sculptor’s name ‘Matere’ or ‘Matera’ may not be known instantly. This name belongs to the sculptor Bernard Matemera. Even Bernard Matera used that name in this period, unless it is a misspelling from Joy Kuhn. She also didn’t mention the year in which the sculptures were produced. In spite of these minor objections the book is useful, because she interviewed a lot of sculptors from the first generation. In this way we get an insight in the beliefs, motivation and thoughts of the sculptors during the sculpting. Joy Kuhn talked to the, meanwhile, deceased Bernard Takawira. 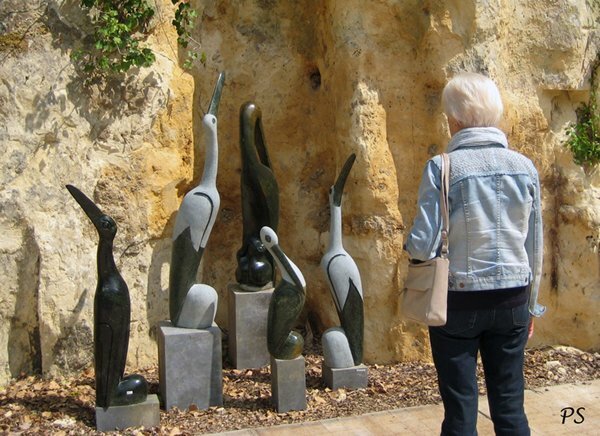 He explained to her how animals can influence sculptors in their work. 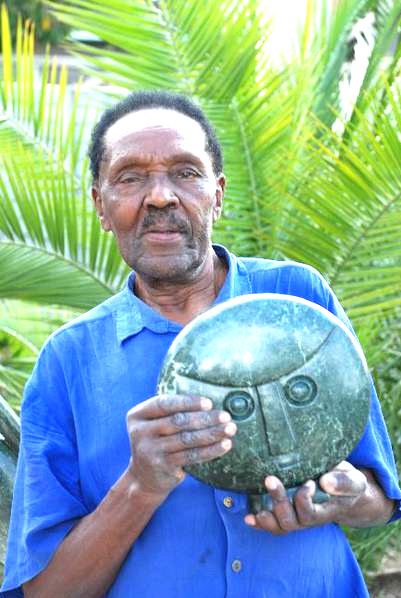 Bernard Takawira was a member of the Nyatate sculptor group around Joram Mariga. His brothers John, Patrick and Lazarus were also sculptors. 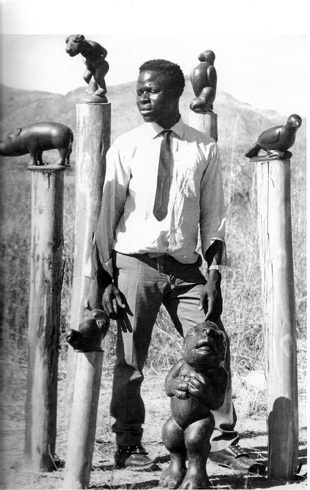 Bernard Takawira was born in 1948 and belongs to the Shona people. He was one of the twenty-four children in his family. He followed the primary and the secondary school and received a degree in agriculture at the Mlezu Agricultural College. Owls, though, the Shona fear them. They are always associated with witchcraft. For we believe that women, in particular, can be transformed into animals – then creep into your house and sit on you, so you wake up feeling sick. First the owl – then, the hyena, then the ant-eater, then, the bat. If the mongoose crosses your path you know that where you are going things are not right. It is better, then, to go home. And if you see a chameleon digging, it is bad; you will get sad news, particularly about death…..(Kuhn 1978, 14) [Note 2]. 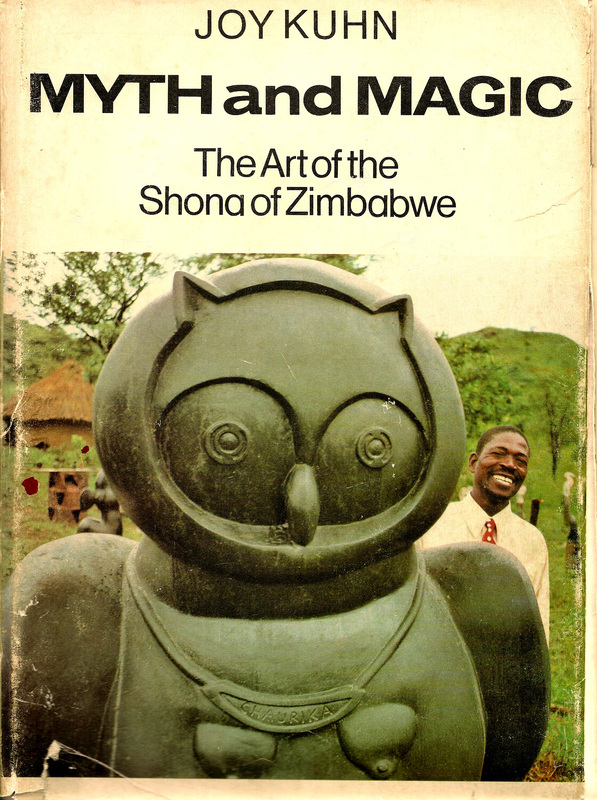 The sculptor on the cover of the book Myth and Magic, is Ephraim Chiruka (see Fig. 1). He called his sculpture a Huge Owl [Note 3]. 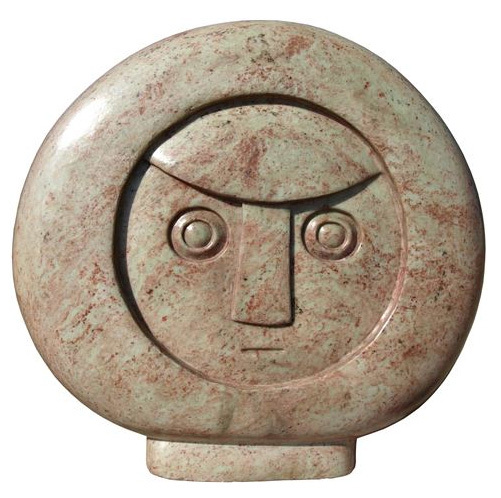 He was a nephew of Chimbewere, the Chief whose spirit guards the sculpture village of Tengenenge (Kuhn 1978, cover). 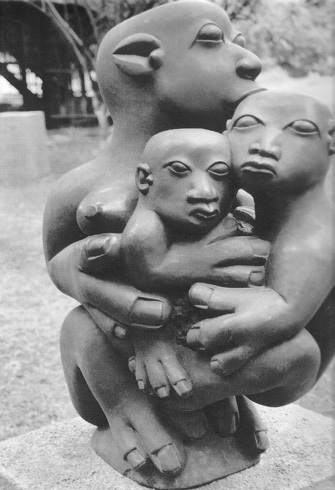 Ephraim Chiruka provided his sculpture with women’s breasts. The breasts of a witch, he said. He was born in 1940 in the Guruve area and belongs to the Shona people. He started sculpting in 1966 in the Tengenenge Sculptor Community. His favourite theme was horses, because they reminded him of old people who use horses for transport to move their goods from one place to another (Joosten 2001, 165/166). 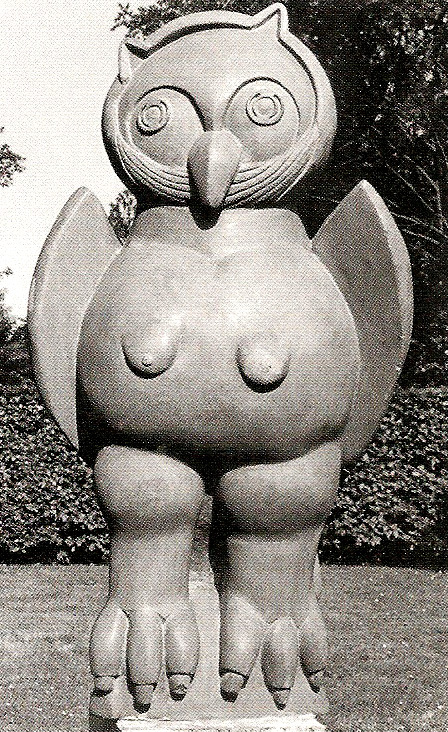 The Huge Owl was not the only owl which Ephraim Chiruka sculpted. 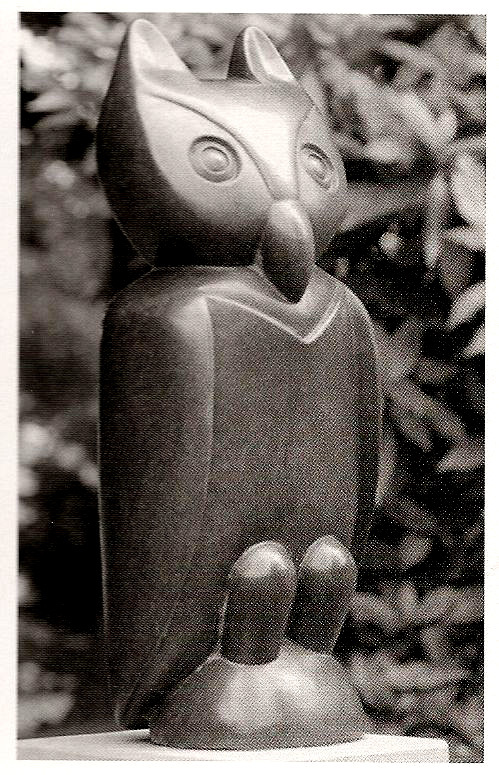 He carved a bewitched owl as well which he called Owl Woman (Fig. 2). Fig. 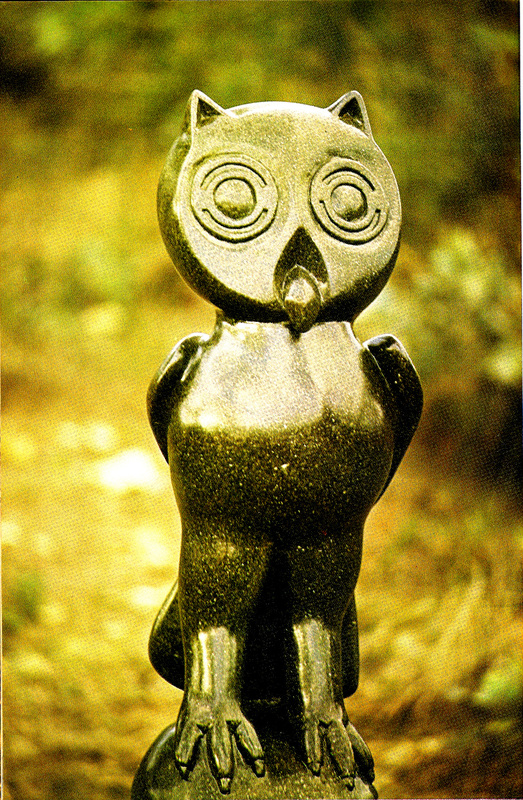 3 Owl, sculpted by Ephraim Chiruka, year of production unknown (Kuhn 1978, 58). There are also owls carved without signs of the spirits of witchcraft, like the owl of Henry Munyaradzi. This is rather an elegant sculpture of an owl. Unfortunately, the year of production is not known. Henry Munyaradzi was born in 1931 in the Guruve district. He belonged to the Shona people. His father left the family when Henry was a young child, so Henry got no formal education. He raised up in the family of his nephew Edward Chiwawa. As a youth Henry herded cattle. In 1968/1969 he started sculpting in Tengenenge. He is auto didactic and became successful immediately. In 1975, due to the Liberation War, it became too dangerous in Tengenenge. Henry moved with his family to Chitungwiza. In 1985 he bought a farm in Ruwa, east of Harare, where he died in 1998 (Joosten 2001, 283). Edward Chiwawa was born in 1935 in the Guruve district. He belongs to the Shona people. He is a nephew of Henry Munyaradzi. He saw his nephew during the act of sculpting. He started sculpting himself in Guruve in 1970. He was taught by Wilson Chikawa. 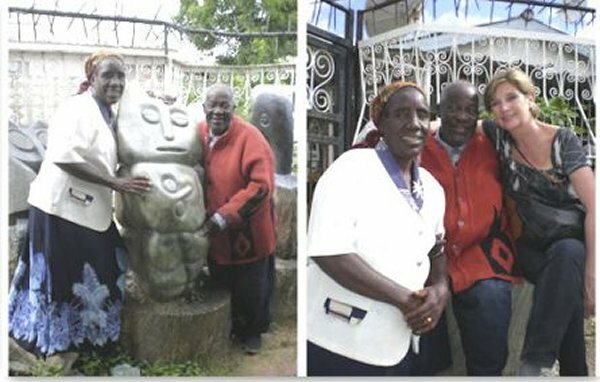 He brought his sculptures to Tengenenge to sell them. 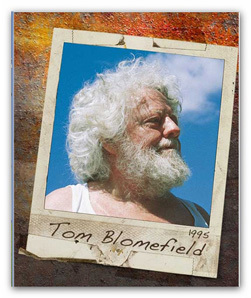 In 1975, due to the Liberation War, Tengenenge was closed and in Guruve it became too dangerous, so Edward moved with his family to Harare, to join Tom Blomefield. After the war ended Edward did not return to Guruve. 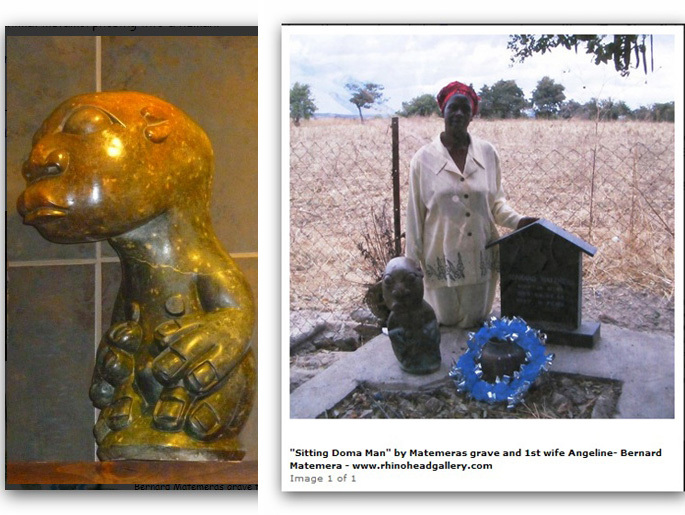 He now lives in Chitungwiza and is still sculpting (Joosten 2001, 175/176). 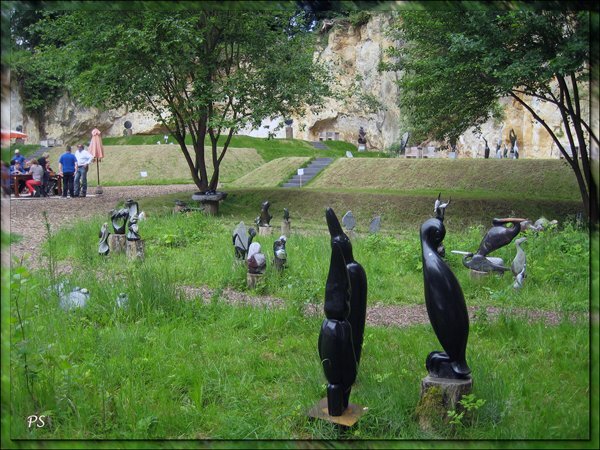 In my first paper Sculptors from Zimbabwe (part 1), I mentioned that I met Edward Chiwawa last year in the sculpture garden Beeldentuin Maastricht – Heerdeberg in the Netherlands. Around 1988 he sculpted an owl (Fig. 5). This owl has been exposed in the collection of the Afrika Museum, Berg en Dal, the Netherlands. 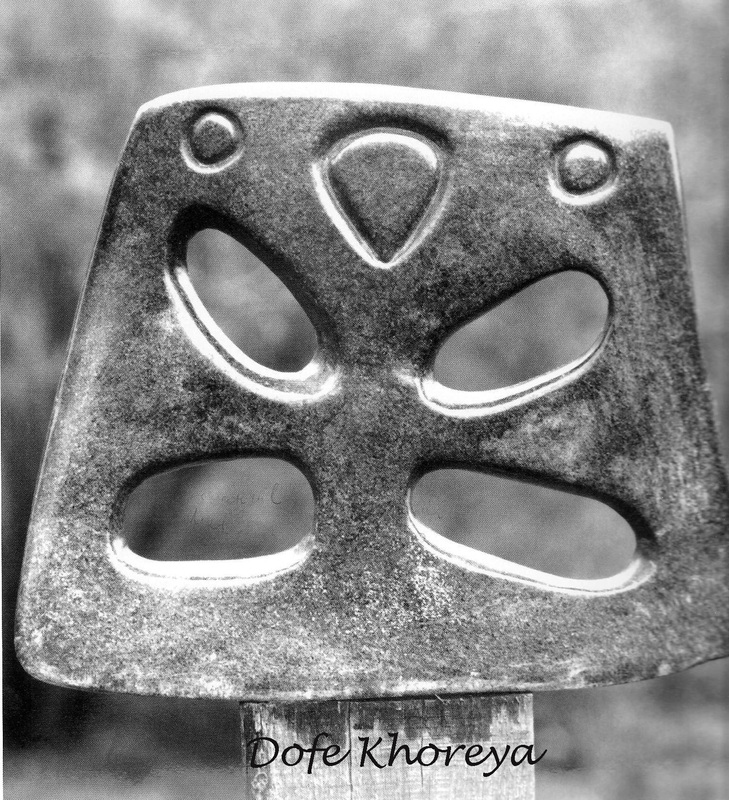 Another owl is the owl sculpted by the sculptress Dofe Khoreya (Fig. 6).This is an owl in modern art, totally abstract. The owl is recognizable by the beak. The year of production is about 1968. 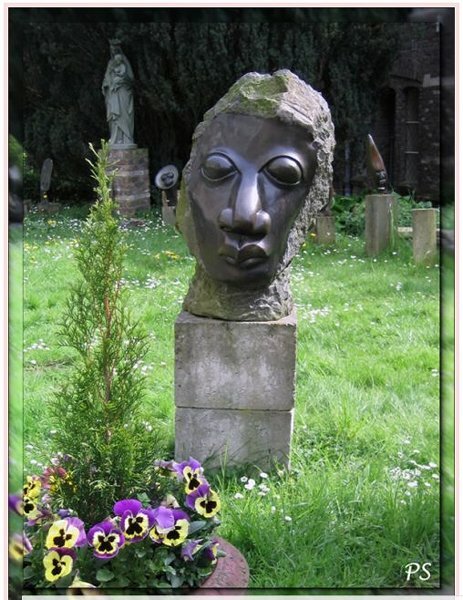 The sculpture belongs to the collection of the Afrika Museum, Berg en Dal , the Netherlands. I don’t know what the sculptress wants to express with the holes in her piece of art. My interpretation is that both the upper holes are wings and the lower holes are paws. Has someone got another idea of the meaning of these holes? A hiding place for spirits could also be a possibility. 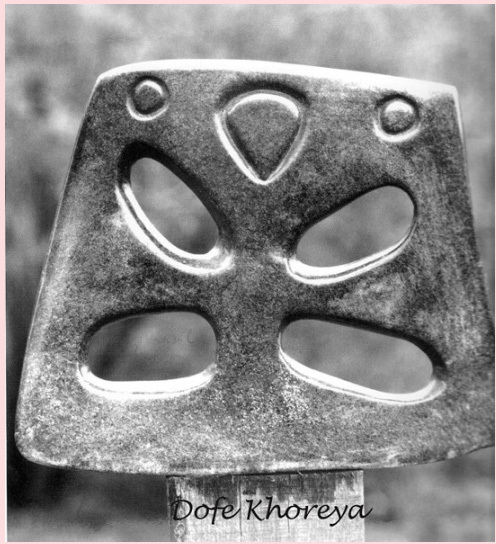 Dofe Khoreya was born about 1939 in Malawi. She married Bauden Khoreya, also a successful sculptor. They have one son Harry, who is also a sculptor. Bauden and Dofe started in 1968 with sculpting in Tengenenge. Dofe was one of the few women, who sculpted. In that time sculptors thought that women could only help by polishing the sculptures men produced. The family lived in the Tengenenge Sculptor Community until 1976 (Joosten 2001, 212-215). 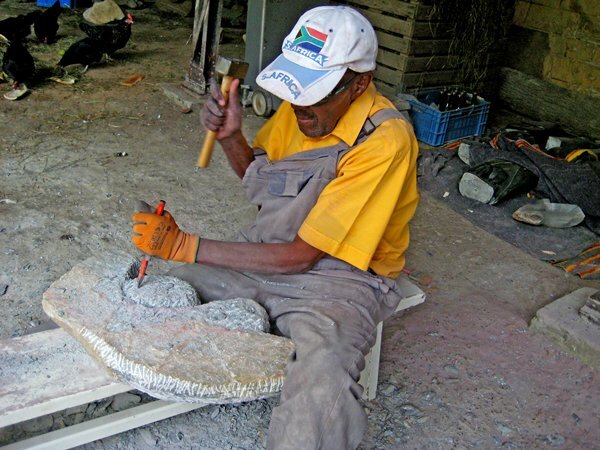 Moveti Manzi is a sculptor of the second generation. He was born on the first of January 1960 in Centenary. His father Josiah Manzi was also a successful sculptor. 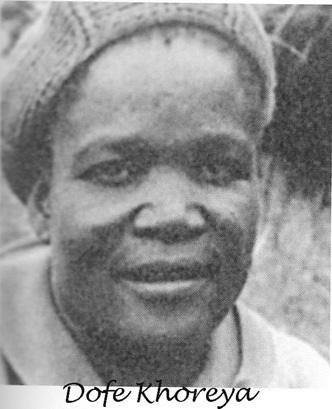 The parents of Josiah Manzi moved from Malawi to Zimbabwe in 1918. His mother Jenet Manzi is a sculptress. 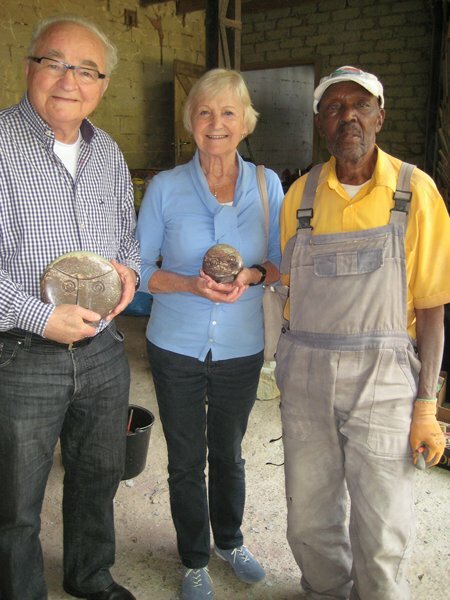 Josiah started sculpting in the Tengenenge Sculptor Community in 1966, Jenet started there in 1968. Josiah sculpted print stones as well. So did Moveti Manzi when he was a boy. In 1997 three print stones were found in the mud in Tengenenge, two belonged to Josiah, and one to Moveti. The last one is saved in the Tengenenge Museum in Dodewaard, the Netherlands (Joosten 2001, 338). 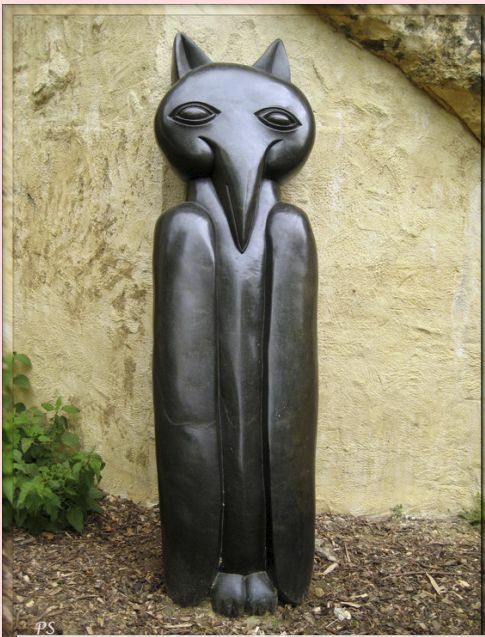 From Moveti Manzi an owl is exhibited for selling in the sculptor garden Beeldentuin Maastricht – Heerdeberg, the Netherlands (Fig. 7). Jonathan Zilberg devoted in his dissertation, as mentioned in note 1, a chapter on “Spirits in Stones” referring to the belief in spirits of the Shona People. 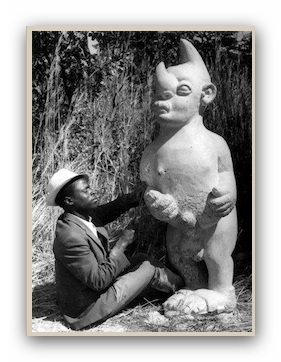 He cited Joy Kuhn’s book Myth and Magic, when she expressed, after interviews with the sculptors Sylvester Mubayi, Nicholas Mukomberanwa and Joseph Ndandarika, their belief in spirits. They stipulated that they converted this belief in their stones (Zilberg 1996, 167 – 176). 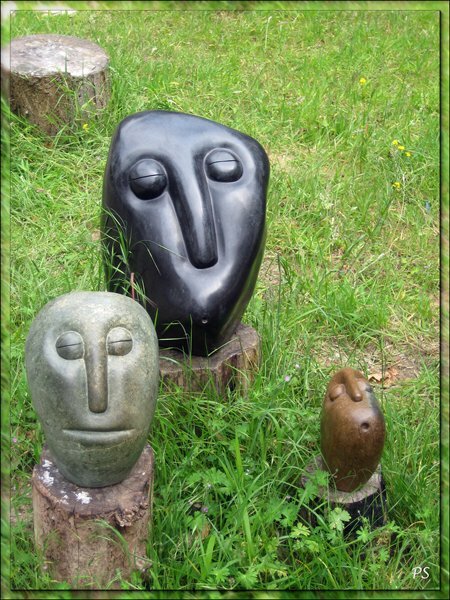 Shona sculptors feared the spirits of animals, like the owl, the hyena, the ant-eater and the bat. Especially the spirits of the owls, who – according to them – practiced their witchcraft on women. In Athens the Greece people endowed the owl with wisdom, the Shona in Zimbabwe endowed it with witchcraft. 1. 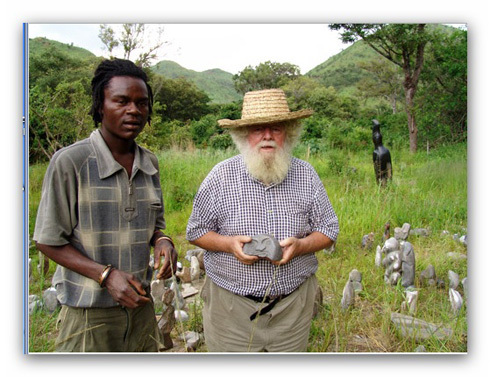 Jonathan Zilberg received his doctorate of Philosophy in Anthropology in 1996 in the Graduate College of the University of Illinois at Urbana-Champaign with the dissertation Zimbabwean Stone Sculpture. The Invention of a Shona Tradition. Before and afterwards he wrote many publications about this subject. He is one of the few scientists who made their publications fully accessible for everyone. 2. Olga Sicilia found this aspect so important that she cites this passage out of Kun’s book in her dissertation There is No Such Thing As a Spirit in the Stone. , Misrepresentation of Zimbabwean Stone (Sicilia 2009, 96). 3. The titles given to sculptures are often arbitrary, are often made up by dealers or writers. The artists themselves can change the names of the titles depending on whatever they think that the buyer or photographer wants to hear (communication Zilberg).